BentoLunch.net - What's for lunch at our house: Muffin Tin Monday - Breakfast Pancakes! 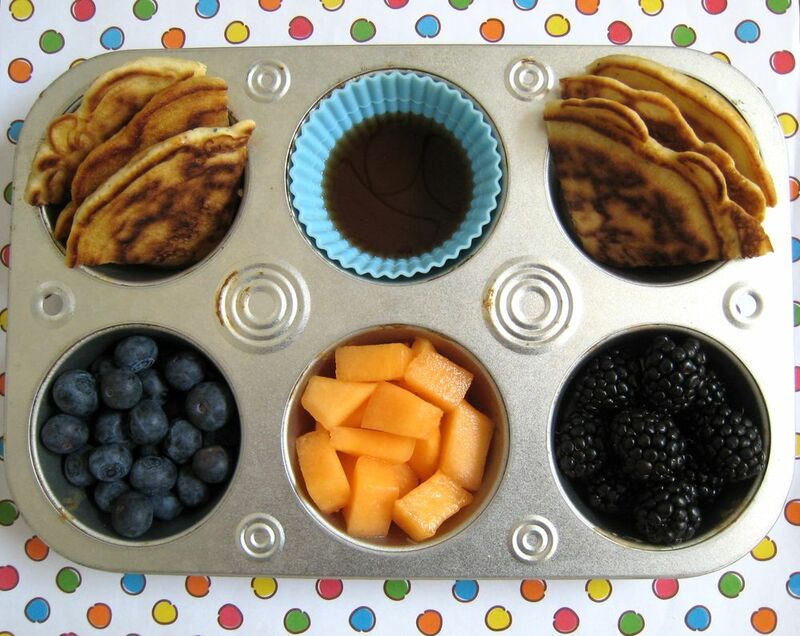 Muffin Tin Monday - Breakfast Pancakes! Time for Muffin Tin Monday, and it's a no theme week. In our case, we opted for a breakfast/use out some leftover pancakes kind of theme. Shaun made really good berry pancakes the other morning, and we had 2 leftover, which isn't really enough for another breakfast (you try giving one pancake per kid). However, Ben really wanted the pancakes and Faith didn't, so it worked perfectly for a muffin tin. Ben has the berry pancakes, quartered for easy dipping, along with real maple syrup (pure Canadian maple syrup that we brought back from our Canada Christmas trip). To go with that, he has more berries, both blackberries and blueberries, along with some sliced cantaloupe. Easy and yummy! I love real maple syrup! And blueberries are so yummy! Happy MTM! I love all the berries to go with yummy pancakes. Looks delicious!! Berry pancakes sound so good! Berry-licious! I've never done leftover pancakes... do you freeze or fridge them? I hate throwing them out! These ones were in the fridge, but I've frozen them in the past. Just put them in the toaster oven like a frozen waffle, and perfect! Looks like it was a delicious meal - especially the berries. I've been looking for breakfast ideas - and yours is very inspiring!